Check back again this week for more holiday ideas! And back to these carrots! You can make them ahead of time and store in an air-tight container in your refrigerator and serve cold or make immediately and serve while still hot. Either way, your guests will love the tender roasted carrots and the earthy, slightly sweet dressing. Wash and peel carrots and trim ends. Slice carrots lengthwise. In a medium-sized bowl, toss carrots with 1 tablespoon olive oil, 1/8 teaspoon salt and pepper. Transfer carrots to a cookie sheet lined with aluminum foil or a roasting pan, cut side down. Bake in oven for about 25 minutes, or until tender. In a small bowl, prepare the dressing by adding in 3 tablespoons olive oil, turmeric, lemon juice, maple syrup, dijon mustard, mint and 1/8 teaspoon salt and whisk together until combined. Transfer carrots to a serving platter or dish and toss with dressing. “Tell me one thing you’d like to learn more about (the low-FODMAP diet) and I’ll choose ten comments to respond to via a blog post.” There was a huge response, and many of the ten questions I chose did not come with simple explanations (as you all know perfectly well, this is certainly not a simple diet!). Also, everyday I receive dozens of questions about the diet via Facebook, Instagram, Twitter and email. 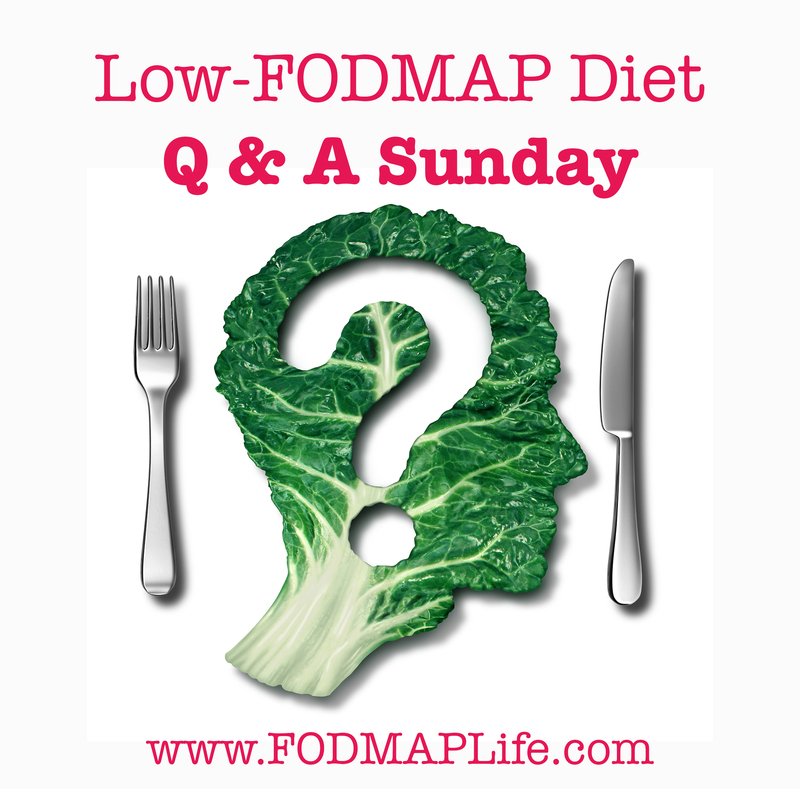 So I felt it was a great opportunity to do something different and bring you the Low-FODMAP Diet Q & A Sunday. When ever you see the image above on my social media channels, just ask your question below the image and check my blog every Sunday to see if I’ve answered your question. Take this opportunity to read other fans’ questions as you will learn much about the low-FODMAP diet! Quinoa flakes with almond milk, 3/4 cup strawberries and 10 macadamia nut halves or other low-FODMAP nut. Lactose-free yogurt with 10 raspberries, 10 walnut halves and a sprinkle of unsweetened coconut flakes. Gluten-free toast with 1 tablespoon sunflower, peanut or almond butter and two small, peeled kiwis. To answer the other question, some people feel results in a couple days, some a couple of weeks. Everyone is different, and it also depends how diligent you are about following the diet. Thankfully up to 70% of people following the diet can find an improvement in symptoms (per research by Peter Gibson, a professor of gastroenterology at Australia’s Monash University, and co-founder of the low-FODMAP diet). Answer: Some people have trouble digesting FODMAPs due to the fact that FODMAPs ferment, causing gas/wind, bloating, diarrhea, distention and/or constipation. FODMAPs are short-chain carbohydrates which are poorly absorbed in the small intestine (your small intestine is supposed to absorb nutrients and minerals from food) and then are rapidly fermented by bacteria in the gut. The bacteria produces gas which plays a large role in the onslaught of symptoms. The bacteria are basically eating FODMAP carbohydrates and then fermenting the sugar molecules. Since fermentation causes gas it can make diarrhea worse or contribute to constipation. The methane gas that is produced can cause constipation while the hydrogen can increase GI motility. What is GI motility? It is defined by the movements of the digestive system, and the transit of the contents within it. When nerves or muscles in any portion of the digestive tract do not function with their normal strength and coordination, a person develops symptoms related to motility problems. These FODMAPs or small undigested remnants of oligosaccharides, disaccharides, monosaccharides and polyols accumulate gases and cause what is called an osmotic effect. FODMAPs are “osmotic” which means they cause water to be drawn into the intestines, leading to diarrhea. Stool stays more watery than usual which leads to bloating, gas, diarrhea, and pain. The food we eat is broken down by one or more enzymes which are chemicals that digest foods into energy for your cells. In order for carbohydrate digestion to take place we need amylase. Amylase is produced in the pancreas and the glands that make saliva. As you chew, the amylase continues to break down carbohydrates throughout your digestive system. Amylase breaks down carbs into their individual sugars as they pass from the mouth to the stomach and the gut. 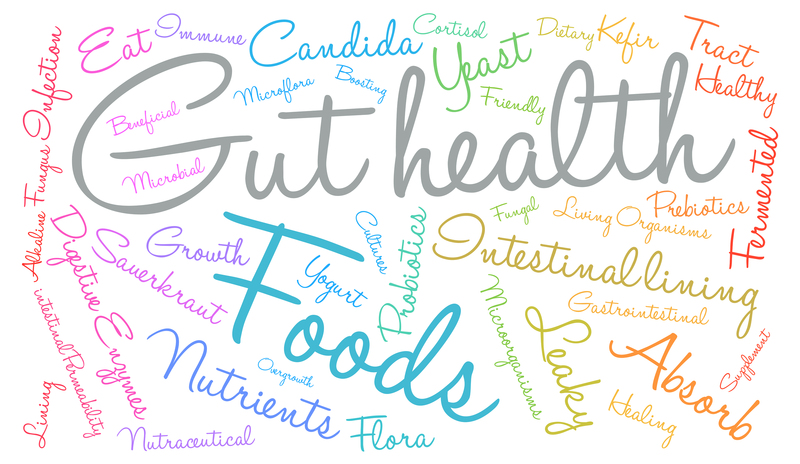 The cells lining your gut can absorb them and distribute them to other parts of your body for energy. (a) Amylase is the main enzyme responsible for starch digestion, and if the quantity of starch consumed is so high that not enough amylase is available to keep up with it, your gut may not digest everything. Some FODMAPs reach the large intestine intact because a person does not have the enzymes necessary to digest them. People who have lactose (the disaccharide “D”) intolerance have a deficiency of the enzyme lactase (needed to break down lactose down into simple sugars). Everyone reacts to raffinose (one of the oligosaccharides, the “O” in FODMAPs), because humans lack the enzyme to completely break it down. Raffinose is a sugar present in sugar beet, cotton seed, and many grains. It is a trisaccharide containing glucose, galactose, and fructose units. (b) Fructose (the monosaccharide “M” in FODMAPs) is a simple sugar and doesn’t need to be broken down further. It is difficult to absorb, so it stays in the intestine instead of getting transported through the intestinal wall into the body. So for instance, with fructose malabsorption there is an increased concentration of fructose in the entire intestine. In order for fructose to be absorbed in healthy people, only about 25–50 g can be consumed per sitting. People with fructose malabsorption absorb less than 25 g per sitting. “Humans have a limited absorptive capacity for fructose since its absorption is an energy independent process and this capacity is quite variable [9, 10]. “Malabsorption of fructose generates an osmotic force which increases water influx into the lumen and then leads to rapid propulsion of bowel contents into the colon, which is then fermented and leads to production of gas. “The most common structural forms of fructan are inulin, levanare and geraminan. The human body has limited ability to break down these oligo- or polysaccharides in the small bowel and only absorbs 5 – 15% of fructan [22, 23]. The mechanism for malabsorption and intolerance is related to the lack of enzymes to fully hydrolyze glycosidic linkages in the complex polysaccharide, and therefore results in the malabsorbed fructans to be delivered to the colon, which are then fermented . Furthermore, the small molecule of fructans draws more water into the intestine which can result in bloating and diarrhea . “At least 70% of polyols are not absorbed in healthy individuals . Then there is STRESS and did you know that stress can affect bacteria? When you are going through a rough time like the death of a loved one, the loss of a job or the ending of a relationship, the emotional stress you experience releases adrenal stress hormones, like cortisol and adrenaline. Your brain gets worked over by these stress hormones as your vagus nerve gets stimulated. The brain-gut connection is this same vagus nerve that is involved with stress. Your blood supply is reduced and therefore it’s harder for your body to properly digest foods and manage the balance of bacteria (a balance is essential for your gut-microbiome). Stress hurts your digestion, and poor digestion makes you feel more stressed. That’s it for this Sunday. Don’t forget to follow me on social media an sign up for my newsletter! Have a great rest of your day, and I look forward to your questions! Chow J, Lee SM, Shen Y, Khosravi A, Mazmanian SK. Host-bacterial symbiosis in health and disease. Adv Immunol. 2010;107:243-274. Eckburg PB, Bik EM, Bernstein CN, et al. Diversity of the human intestinal microbial flora.Science. 2005;308(5728):1635-1638. Turnbaugh PJ, Gordon JI. The core gut microbiome, energy balance, and obesity. J Physiol. 2009;587(17):4153-4158.